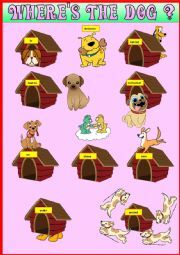 A simple reminder of the most common prepositions of place. Fort the little ones and beginners. Hope you like it ! 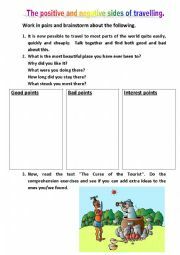 A reading comprehension activity for intemediate level. 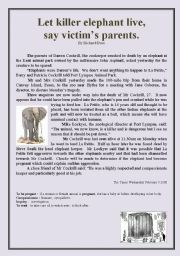 A tragic but interesting and relatively easy newspaper article about a KILLER ELEPHANT that killed its zoo-keeper, but was finally spared. 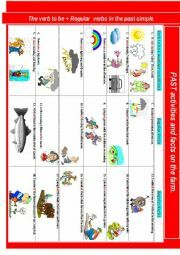 Then, followed by a number of comprehension questions and vocabulary exercises. This text works very well with my students. Hope you have fun with it ! 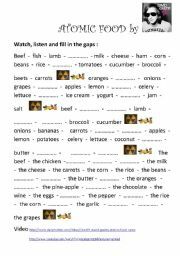 I made this worksheet to enable my students to learn regular and irregular verbs in context. I hope this will help them. This ws of course not entirely satisfactory. I will try to produce a more efficient one, on which they will have to produce the answers for example. I just need some more time. Hope you´ll like it anyway ! The positive and negative sides of travelling. 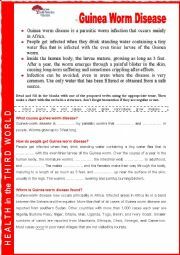 Guinea worm disease. 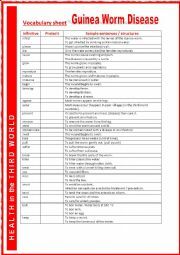 Vocabulary sheet. 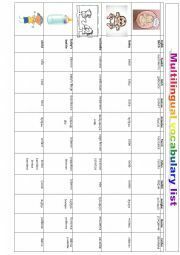 Every now and then it is useful to give our ss vocabulary sheets or to show them what an efficient vocabulary sheet is. Not just words in alphabetical order followed by their translation.